Dec 9th 2104 was our Xmas dinner “meeting” at the Pony Corral on Grant, many members showed up and enjoyed dinner & drinks as well a lot of visiting and story telling. Our newly elected VP took the opportunity address the group and wish all Happy Holidays. Sept 27-28 2014 the MMC was inducted into the Canadian Motorcycle Hall of Fame in Edmonton Alta. 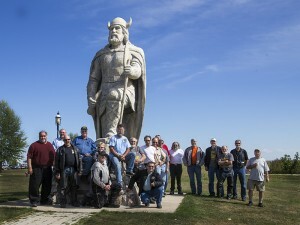 26 Bikes and 29 riders made it out to the 6th annual AMCM “Fishing trip” to Gimli. The day was cloudy for the most part but warmed up by the afternoon. No final tally of funds raised for Spina Bifida and Hydrocephalus Association yet, but I’m sure Greg O’Kane will have a report by the next meeting. Thanks to everyone who came out or supported the fundraising ride by sponsoring a rider. Update: a total of $2255 was raised by the “Fishing Trip” and further donations,sales and events added to the fund for a grand total of $2564. I got a request through the web site from a lady in Anola that her 85 year old mum always wanted a ride in a sidecar. So I contacted her and on Saturday. Marie and I went to Anola and I took her for a ride.What a super lady she was so excited and surprised that her daughter had arranged this for her. She smiled the whole time she was in the sidecar and asked if we could go to BC. It was an absolute pleasure to meet these two people and we have a date for August to do it again when hopefully it is not as windy. The 2014 Bison Classic Motorcycle Rally was a great success and some thank-yous need to go out. And the many more that stepped up and helped a little or a lot and also to all that attended. If you are interested in a DVD slide show of the Rally weekend contact us via email or at a meeting to order a copy. Cost is $5.00 and all the money goes to the The Spina Bifida and Hydrocephalus Association of Manitoba. The second annual Tiddler Run took place Sunday June 22nd. Hosted by Keith Blais, the group left his place close to the Birdshill park entrance on 59Hwy finding our way north along the east side of the Red River at an average speed of 60-65 kph to the Selkirk bridge. A stop for pictures at the Marine museum and then south along the other side of the river and crossed the Lockport bridge on the way back to Keith’s place. Only a couple of minor running issues on the return trip, but a few bikes did not pass tech inspection due to being bored or stroked or both, thus exceeding the maximum cc. limit of 305 even though having the correct badging. Good weather and good eats added to the great event, Thanks Keith. THE BUFFING WHEEL Of all the refurbishing jobs I love to do and with my restoration hobby, there are quite a few The one I like least, and there are not a great deal is a marathon session on The Buffing Wheel Clad in gloves, hat and mask on my face I look like an alien from outer space! That alloy chaincase or front wheel backing plate come up with a shine that bikers appreciate Black stick for the rough stuff- then brown to finish end up with white, finally green for a polish Now off to the shower to get rid of the feel of the disgusting black stuff off – – THE BUFFING WHEEL! Who’s the man behind these sunglasses? It’s a much younger Ray Houde. October Meeting saw our Octogenarian and Honourary Member Billy Watt step up to give a most interesting talk on motorcycling in Manitoba in the 1950’s. 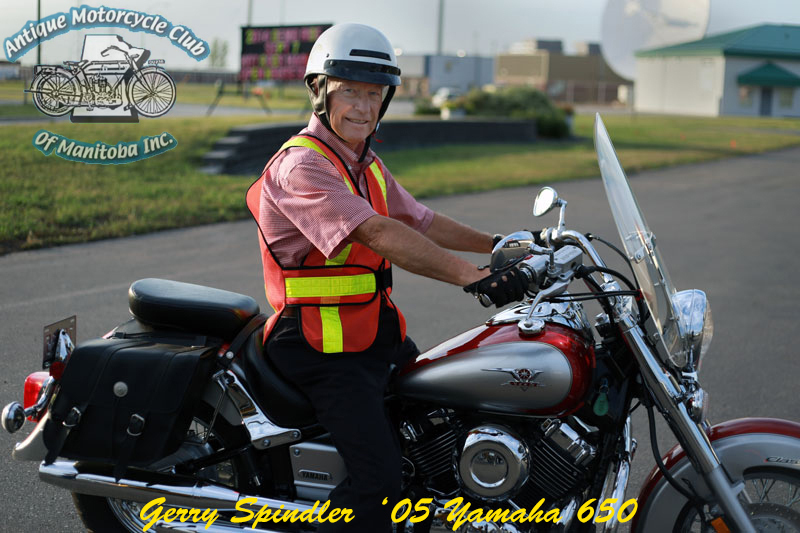 Ably assisted by his very old friend Joe Sawtus they had both been members of the long defunct Winnipeg RoughRiders Motorcycle Club, and then later of the Manitoba Motorcycle Club which has now been officially amalgamated with the Antique Motorcycle Club. 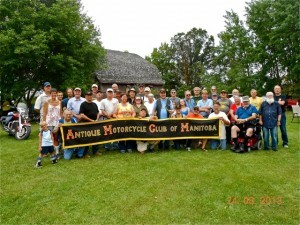 The MMC was started in 1911 and is the oldest motorcycle club in Canada. 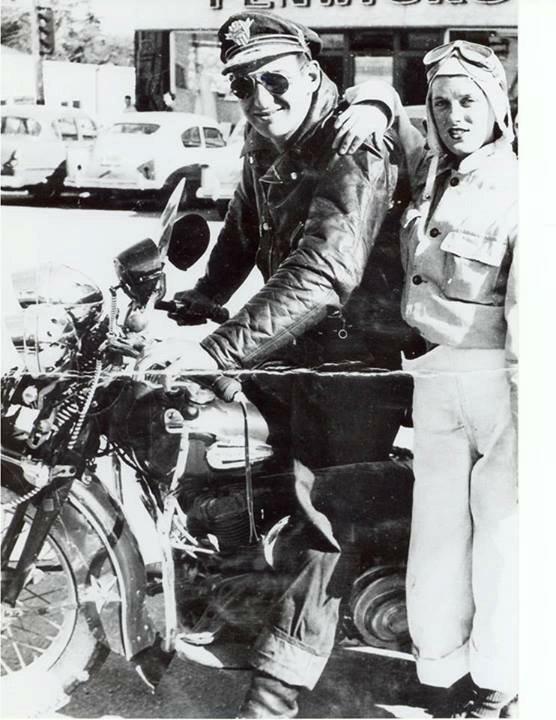 Bill was wearing his very colourful RoughRiders jacket with the patches proudly displayed and passed around pictures of motorcycle events of the 40’s and 50’s, and at least one of our members picked out his father in the one old photo. Bill and Joe have been fast friends since they were 8 years old, lived through and survived WW2 and many hair-raising motorcycle escapades together. Joe was heavily involved in all manner of motorcycle racing whilst Bill remarked that the only racing he got involved in was when he was running away from the cops! Told us afterwards that ” the cop is still alive and the bugger lives in Winnipeg! 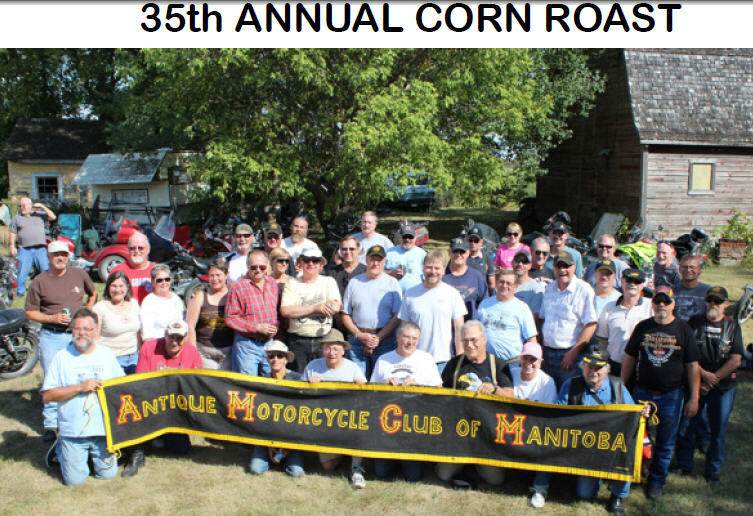 !” This video clip could well become part of the Antique Motorcycle Club’s links with Motorcycling history in Manitoba and certainly remain part of our archives for posterity. Thank you Billy and Joe. Okay, run this by me again, to get it running, you tickle it, kick it and swear at it ???? 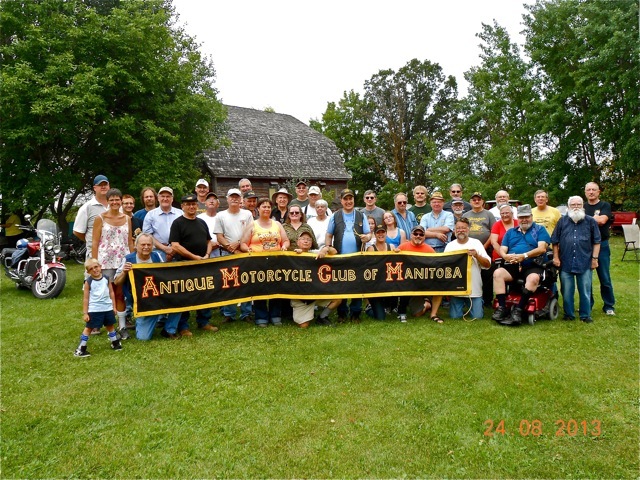 The Spina Bifida and Hydrocephalus Association of Manitoba is The Antique Motorcycle Club of Manitoba’s official charity organization. Ross Metcalfe (pres AMCM) hands Connie Hesom treasurer of the The Spina Bifida and Hydrocephalus Association of Manitoba a cheque for $2361.00 representing donations made over the last year at certain AMCM functions. Connie then addressed the meeting with a presentation on Spina Bifida and Hydrocephalus and her and her husband Terence’s personal experience with the condition through their son Evan. On a side note during the meeting Evan was in charge if mystery part security making sure no one peeked in the bag. We are starting to believe Barry Smith who claims for the third consecutive year that he “has influence,” and is responsible for organizing the perfect weather once again! Thanks Barry for a perfect Saturday afternoon which saw no less than 50 motorcycles and seven cars out this year. 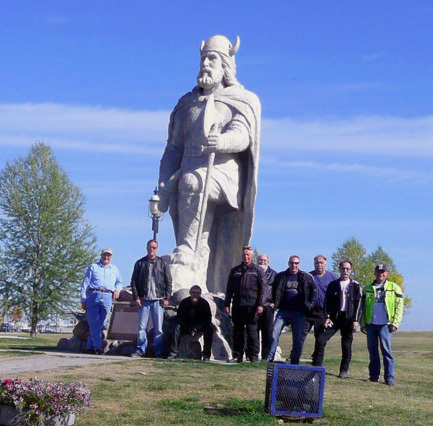 CVMG President Terry Newstater and about eight of his members were the first to arrive at the meeting place in Carman, soon to be joined by a whack of AMCM guys from inside the perimeter and further north. A couple of casualties (inevitable on old motorcycles) had some being picked up by car and one: said to be a 450cc Honda hooked up to a sidecar with passenger, overheated. Once it had been left to cool down and having shed the passenger we believe it made it the rest of the way. Rumour has it that there were many offers to pillion the female passenger! The Bob Diemert visit was interesting as were Bob’s stories of classic cars and aircraft. Then Greg and Marie led off for the trip to Morden with a guarantee of getting there after Tom’s offer of leading was turned down by popular vote! Chas’ lawned and shady backyard was again the perfect venue for homemade burgers, chilli and dessert. Over 80 hungry motorcyclists sat down to enjoy the barbecue and ther was plenty of food for even the most voracious apetite. Tom’s burgers fell apart AGAIN much to master barbequer Terence’s displeasure. Too spicy perhaps. The distinctive roar of V8 engine heralded the arrival of the “Black Widow”; a trike with a motorcycle front end built in Morden by students of a local welding school.The helmet was passed and an amount of $260 was donated to our Spina Bifida charity after expenses. President Ross gave thanks to the organizers, family members and helpers of this 7th Conquering Perimeteritis Run; perhaps the most successful yet. A hardy group of members and guests made there way out to the 13th annual Metcalfe’s Movie Night. Jan 28th 2014. The temps were not as cold as it had been earlier this winter but still definitely winter in MB. At least it wasn’t storming. A number of two wheel themed films were viewed during the evening including one strange “motorcycle movie” that had most everyone in the room laughing. Thanks Ross for opening up your home once again an allowing us in to your personal museum of motorcycles and related memorabilia. A big thank-you to Ross and Kris Metcalfe for organizing and hosting the destination of the 1st annual Assiniboine River Tiddler Tour. Sunday Sept 15th2013 saw riders and their 305cc and smaller bikes (Tiddlers) gather at the Tuxedo Shopping Center for the beginning of the tour. The group proceeded along Roblin Blvd. with some stopping at times to Tinker with their “Tiddler” usually addressing fuel delivery problems. Eventually 14 riders and their bikes showed up at the Metcalfe residence although a couple of bikes required the Rescue Ranger to haul them the rest of the distance but after some more Tinkering all were running again. Rollie C. kept track of the riders and their bikes and computing their combined age and ranked them in order. Each rider received a specially labelled and serialed bottle of ART Tour wine. Ross Metcalfe took bottle with serial # 1 for the oldest combined age score for him and his 1951 Francis Barnett 197cc Tiddler. Barbequed hot dogs and a birthday cake were washed down with some prize wine and soft drinks before people eventually Tiddled off in different directions home. Talk of the 2nd annual ART Tour has already started so if you have, or come across a small bore motorcycle keep it in mind. The weather was kinder to us this year and lovely sunshine and very little wind made for a very pleasant run to Gimli. Changing to a little earlier in September and also to a Saturday helped towards a better turn-out than last year. 21 bikes came out with 24 guys and one lady sitting down to the “eat as much as you can” fish dinner. Champion fish eater Greg Kendall equalled his record from last year, so remains unbeaten! An amount of $900-00 was collected for our Spina Bifida charity. This was disappointingly well down on last years collection despite more bikes out. Hopefully some late donations will come in yet. Perimeteritis 2013 was a resounding success again largely due to the weather clearing rather miraculously at the last moment. Chas and Tom would like to thank all the invaluable helpers who worked so hard (again), not forgetting the one who claimed he had influence and arranged the good weather! The following Limerick will make sense to those who rode from Carman to the Thresherman’s Museum. But surprisingly he was never a drinker! The weather cleared and no less than 31 motorcycles turned out to Wellington Crescent to see Dave’s superb collection of classic motorcycles, Jaguar cars and memorabilia, all beautifully displayed and presented in an idyllic setting. Rather difficult to estimate but general consensus was that well over 100 members and visitors came and went during the evening. (Someone said just count how many donuts were eaten!) Three new members joined right away. Another very successful AMCM event and our thanks go to “Digger” Pritchard for hosting and supplying donuts and coffee. Tuesday 22nd January, 2013 saw a near record turn-out despite one of the coldest Manitoba evenings for a number of years. The indomitable Larry Wooley again amazed everybody by arriving on his Ural outfit to put us lesser mortals arriving on four wheels, to shame. Some of us who have attended for many years agreed that President Ross had been busy collecting even more cool and very collectable memorabilia to add to his truly impressive museum-like basement. 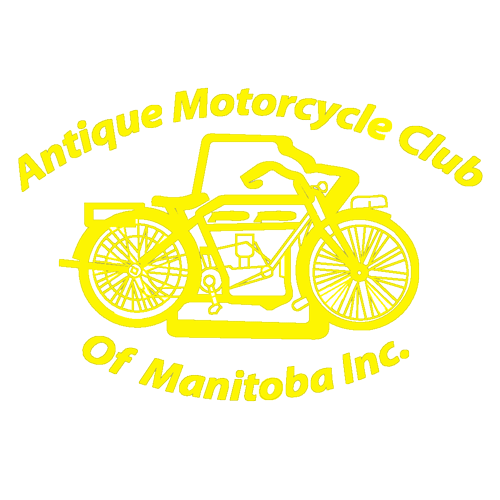 A huge collection of old Manitoba license plates, interesting and rare motorcycles, dealer advertisements, motorcycle-related trivia, ad infinitum, all beautifully displayed with dummies and props. A good number of visitors and non-club members added to the camaraderie. Some faces not seen for a while braved the cold drive out. Anyone who has not seen Ross’ amazing and valuable collection of bikes and memorabilia, is losing out. Another successful AMCM event to kick off what promises to be busy 2013 for our club, with some interesting new events in the pipeline. The Pony Coral on Grant was the new venue for our dinner this year and was a good choice with more space for the 48 members present and good food ably served. Guests of honour for the evening were Niverville Town employees Donna and Robin, who have been so helpful in facilitating our rally over the past two years. President Ross handed over a commemorative trophy to Donna as a token of our clubs appreciation. A fun evening was enjoyed by all. but after Lockport, things fell apart! “I’ve been there many times,” he was heard to say. On a gravel road we had to U turn. that the way to the Choquettes is very easy. ‘specially when your riding slow, on a 45 Harley. Despite the poor leader we got there OK. Even intense heat didn’t spoil the day. Thirty one bikes out, plus about ten cars. A great AMCM outing, the Choquettes are stars. Our thanks for the 37th time, go to John and Pat. What would our club do without members like that?!! The group met at the Tim Hortons in Stonewall at 11am on the Tuesday morning as arranged. Very cold but no wind or rain. There were 11 bikes and 14 people. 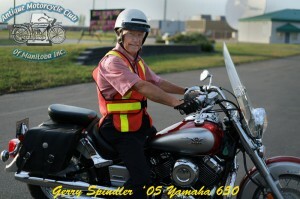 After a hot chocolate warm up we saddled up and rode to Gimli for fish and chips for lunch. Some of the group took advantage of the all you can eat fish (one of our group ate 8 pieces of fish and he is not the biggest person in our group). After a great lunch we went for a walk on the Pier where someone tried to catch their own fish to take home without success. We then went to get the customary picture with the VIKING. Gimli fish was our next stop where most of the group purchased fish one of our group bought 50 pounds lucky(that was why he was pulling a trailer). Our next stop was Tim Hortons on Fermor where we had supper and then went to the meeting. A great ride enjoyed by all despite the cold and we raised $1835.00 FO Spina Bifida so I would say a very successful day. Thank you to all our riders and passengers and a BIG THANK YOU to all our sponsors. Kris’Fish Shop did us proud with a special long communal table. Some of us kept their profit margin to a minimum! who were too afraid of the cold to go! in recognition of his 35 years of unbroken service as Club Treasurer. Members and guests browsed around Ross M’s amazing memorabilia collections of mainly motorcycle-related stuff, but also rare books and badges and you-name-it!. Projects in progress lined the floor and walls, ranging from early Indians and Harley’s to a very rare Johnstone motorcycle V twin engine, said to have been manufactured by the same factory that makes the Johnstone outboard motors. Ross M’s Movie Nights are now a popular yearly event and every year seem to attract some faces who have not been seen for many a year, and always some new ones not familiar to the regular club meetings. A good thing for the Club and the Classic Bike Movement in general. Well done once again La Presedante !! President Ross welcomed Rally Photographer Kathy Harder and her husband as our guests and handed her a Trophy to be given to the town of Niverville in appreciation for their co-operation at the Bison Rally. He went on to thank a surprised Greg O’Kane for graciously accepting the Treasurers job for 2012. Much camaraderie ensued with general consensus that we had all enjoyed a great evening. Well folks our 35th anniversary corn roast is now history and once again Pat and John were superb hosts on a beautiful day. Games were played… corn was ate. Nine hardy bikers from the South braved the fall early morning chill, to ride to Gimli to “go fishing with our wallets!” After eating our fill at “Kris’ Fish Shop” and listening with ill-concealed envy to Tim’s tale of his recent “barn find” 1967 Norton Commando, which he “stole” from some unsuspecting old lady for a ridiculous amount, we went on to one of the many Scandinavian commercial fishing outlets to buy pickerel and smoked fish treats. Then on via the scenic “coastal drive” (lovely fall colours) to Tim’s/Wendy’s on Fermor to eat some more, before going on to the September meeting. Seven of us rode back southwards getting home round about midnight. What a day! What good company! Good grub! Life is good! Lets do the same next fall EH!? Over 75 people attended Heaman’s Antique Autorama featuring very cool cars from another era. This was followed by a great BBQ in Morden.